Gilad Atzmon is an ex-Israeli jazz musician whose new book, The Wandering Who? is quite probably the most antisemitic book published in this country in recent years. As a result of this book, Atzmon spoke last week at Exeter University, at a meeting organised by the Friends of Palestine society (FOP). Next week, he is due to speak at the ‘Raise Your Banners‘ festival in Bradford. The Exeter University meeting was – according to an advert on Atzmon’s website – co-organised by the Palestine Solidarity Campaign; presumably the local branch, as the national PSC have condemned Atzmon, although at the end of his talk Atzmon thanked PSC as well as FOP. The Bradford festival is part-funded by the Arts Council and the Co-operative Membership, and will take place at the Kala Sangam Centre – itself supported by the Arts Council and Bradford District Council. Those organisations who host Atzmon, and the bodies who support them financially, should be aware that their platforms and support will be used by Atzmon to make the kind of grossly offensive and anti-Jewish statements usually only heard at neo-Nazi meetings. They need to consider whether this is an appropriate use of their facilities and funding, and whether they want to be associated with his views. This post will give examples of what he is likely to say in any public talk that he gives. The idea of “Jewish supremacism” is most commonly associated with American neo-Nazi and former Klan leader David Duke, who wrote a book of that name. Unsurprisingly, Duke has expressed his admiration for Atzmon’s writings. Israel must be, if you want to be politically correct, must be de-zionised, first, it must be de-zionised, but if you want to tell the truth it must be de-jewdified. It is not a coincidence that the great Jews who contributed to humanity and humanism (Jesus, Spinoza, Marx, Simone Weill and others) were self-haters. In other words, Jews who do not hate themselves – Jews who have a positive Jewish identity – do not contribute to humanity. Indeed, according to Atzmon positive Jewish identity is a form of racist supremacism that endangers the world. He repeated this idea in this talk to students at Exeter University. Free speech is an important commodity at a university, but, in the balance between that and safeguarding the well-being of its students, it should not extend to the idea that Hitler may have been right about Jews. the [Nazi] death marches were actually humane. Atzmon claims that he is not antisemitic, because he does not base his views on race or ethnicity and he exempts certain types of Jews from his criticisms. But as the above examples show, any talk he gives is likely to include many components of contemporary antisemitism: the idea that Jewish identity is racist; that collective Jewish behaviour is a negative force in society; that Holocaust Deniers are ethical people doing valuable work; that the future may show the Holocaust in a different light; and that Jewish sensitivities about antisemitism should be mocked. Because of this, he has been condemned as antisemitic by Jewish and non-Jewish anti-Zionists as well as mainstream Jewish organisations. This is not simply a case of harsh disagreements over Israeli policy. If somebody else made similar comments about Muslim identity, or black British identity, they would be generally condemned as Islamophobic or racist. We see no reason why Gilad Atzmon should be treated any differently. It is entirely plausible that audience members, after hearing his ideas, will develop hostile attitudes towards the Jewish Society in their Student Union, or their local Jewish school, or active members of Jewish communities up and down the country. 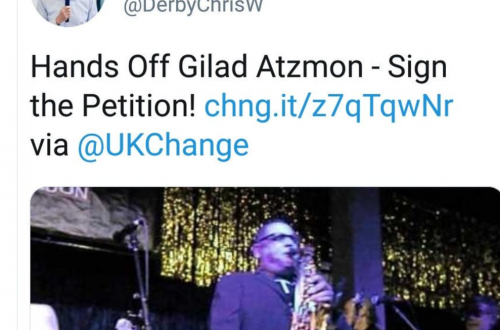 Anybody considering giving Gilad Atzmon a platform to spread these views, needs to ask themselves whether they want to help facilitate the spread of anti-Jewish hostility in this country.